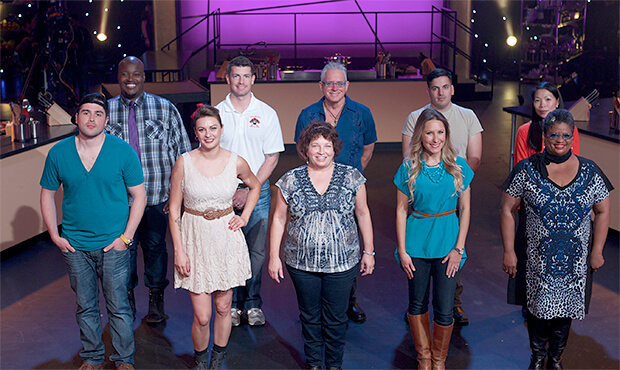 When Bill Joerger is introduced on the Food Network series "All-Star Academy" (March 1, 9 p.m. ET), his back story will likely include his service in the Philadelphia Fire Department (where he's been a lieutenant for the past nine years), his time in the Marine Corps, and, of course, his talents as a cook. But for Joerger, one of his story's most important chapters goes back to his days as a member of the Jersey Surf drum line. "There are so many things in my life that I am extremely grateful for," he says. "I truly believe that had I not been involved with drum corps, I would not be where I am today." After playing percussion in his high school's marching band, Joerger wanted to continue with marching music, and in 1999, found a home in the Camden County, New Jersey-based Jersey Surf. At the time, the group competed in DCI's old Division II, with a schedule that matched with his off-field responsibilities. "I didn't have the time to tour all summer so I joined Surf," recalls Joerger, who played cymbals in 1999 and bass drum in 2000. "My sister Anita was in the color guard. I met so many talented and amazing friends that I still keep in touch with today." 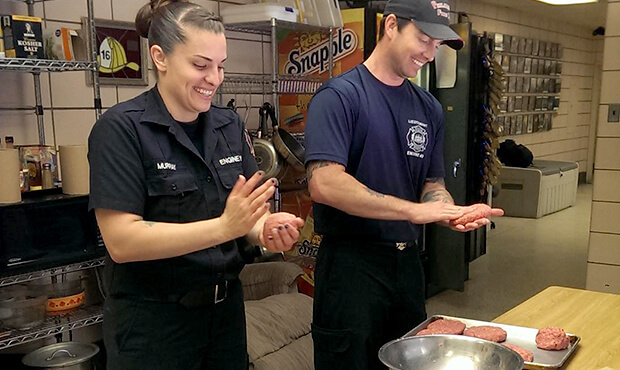 Joerger and his sister Anita, who is a former member of the Jersey Surf color guard, prepare a meal at the fire station. After two years, his increasingly busy schedule put an end to his drum corps tenure, but one very special relationship he developed as a Surf member has lasted ever since: "I never would have thought it, but by marching with Jersey Surf I met my beautiful wife Lehann?”she marched in the color guard alongside my sister," he says. "I have been with her 15 years. I owe it all to being in DCI." He and Lehann now have two girls, Cadence and Brooke, while Anita (who, like Bill, would go on to serve in the U.S. Marine Corps) is also a Philly firefighter. "So many things that were instilled in us during our time in drum corps are still used to this day," he says. "Everyone strives to be the best and that part of me will never go away. DCI is very competitive, so I have that drive to win and be great. It gave me the discipline to focus on the goal at hand." On "All-Star Academy", the goal at hand will once again involve intense competition, but this time in the kitchen rather than on the field. Over the series' eight-episode run, 10 "home cook" contestants will be teamed with four popular chef mentors?”Bobby Flay, Alex Guarnaschelli, Curtis Stone, and Michael Symon?”as they battle for a $50,000 grand prize. If he wins, Joerger intends to put the money toward his daughters' college education. That kind of pressure is nothing new for a firefighter. 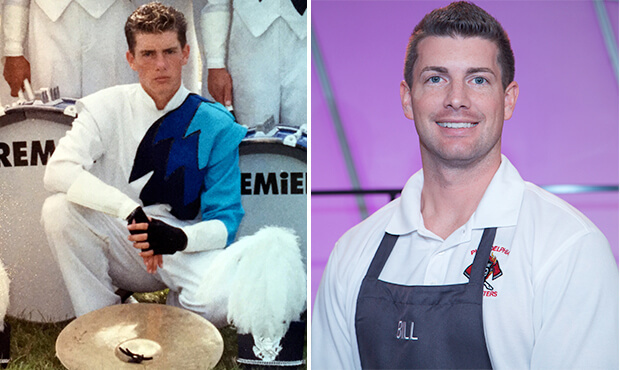 But when it came to self-confidence as a cook, he found himself thinking back to his drum corps days. "My time with the Jersey Surf relates especially to being on 'All-Star Academy,'" he says. "I feel very lucky and honored to be on the show [but] when the opportunity came around, I thought to myself, ?˜I'm not a good enough cook to make it on the show.' But then I thought, ?˜Take advantage of any opportunity?”you never know what could happen.' Just like DCI, you will be amazed at your abilities to push yourself beyond your comfort zone."